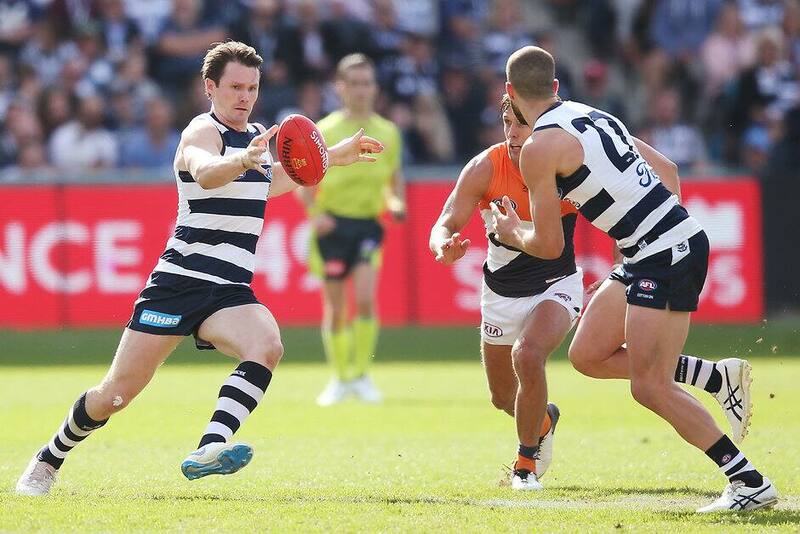 Patrick Dangerfield in action against GWS on Saturday. Three Geelong players have been charged by the AFL tribunal following the club’s loss to GWS on Saturday. Patrick Dangerfield is free to face the Hawks on Easter Monday after receiving a $2000 sanction for striking Giant Matt De Boar during the second quarter. Based on the available evidence, the incident was assessed as Careless Conduct with Low Impact and Groin Contact. The incident was classified as a $3000 sanction as a first offence. The player can accept a $2000 sanction with an early plea. Forward Esava Ratugolea was also fined $2000 for kicking Shane Mumford in a ruck content, while captain Joel Selwood was been charged $1000 for making careless contact with an umpire.